Antarctica is the coldest continent on Earth. Larger than Europe, and roughly circular-shaped, this continent is nearly centerd on the South Pole and is surrounded by the three oceans of the Southern Hemisphere, namely, Atlantic, Pacific and Indian. The situation is quite the opposite in the Arctic region, where there is a frozen ocean (the Arctic Ocean) surrounded by continents. The South Pole is colder than the North Pole precisely because of this different geographical configuration, to which must be added the influence of the altitude: owing to the huge ice sheet that covers the continent (about 90% of the ice, which corresponds to about 70% of freshwater on our Planet, is found in Antarctica), the average altitude is around 2,000/2,400 meters (6,600/8,000 feet), with large areas above 3,000 meters (9,800 feet), so it is far higher than in the other continents, where it's around 700/800 meters (2,300/2,600 feet). Because of these factors, at least in the lowest layers of the atmosphere, there is a circulation that prevents the penetration of mild ocean winds towards the interior: both air and sea currents flow around the continent with an almost circular motion, from west to east (the so-called Antarctic Circumpolar Current). Below the ice cap, there are plains and even depressions, also caused by the enormous weight of the ice itself. However, there are mountains as well, whose highest point is Mount Vinson, 4,892 meters (16,050 feet) high, not far from the Weddell Sea. There are also two large and partially (but permanently) frozen seas, the Ross Sea and the Weddell Sea, formed by two bays that penetrate the continent. The total size of the ice sheet (the one that covers the mainland plus the marine one) vary from about 14 million square kilometers (5.4 million square miles) in March to about 22 million km² (8.5 million mi²) in September: in autumn, the ice advances by about 4 km (2.5 mi) a day, and at the end of winter, almost the entire continent is surrounded by sea ice. The largest iceberg that calved from the ice, was 40 km (25 mi) wide and 400 km (250 mi) long, so it was larger than Belgium. The average temperatures of the continent are extremely low. At the South Pole, 2,800 meters (9,200 feet) above sea level, the average annual temperature is -49 °C (-56 °F), ranging from about -28 °C (-18 °F) in January to about -59.5 °C (-74.5 °F) in July. The lowest recorded temperature is -83 °C (-117 °F), while the highest is -12 °C (10 °F). Here are the average temperatures of the South Pole (Amundsen–Scott Station). However, the lowest temperature ever recorded in the continent, which is also the world record, belongs to the Russian station of Vostok, 3,500 meters (11,500 feet) above sea level, where the temperature reached as low as -89.2 °C (-128.6 °F) in in 1983. Here, the highest temperature ever measured is -14 °C (7 °F). This station is located near the geometric center of the continent, which is decisively indicating that continentality is a determining factor in temperature distribution, even more than latitude. Here are the average temperatures of the Vostok station. There are also inland areas, with no weather stations, where even lower temperatures have been measured by satellites, such as Dome A, located at 4,000 meters (13,000 feet) above sea level, where a temperature of -93 °C (-135 °F) has been estimated. In coastal regions, the climate is much milder. This happens because of the lower latitude (in some areas, the coasts are beyond the polar circle) and of the lower altitude (unlike in the interior, where there is a thick ice cap, here we are obviously at sea level), as well as of the influence of the sea. Here, the temperatures rarely drop below -30 °C (-22 °F) even in winter, while they can exceed the freezing point in summer. The highest temperatures ever measured in the continent have been 14.5 °C (58 °F), recorded on January 5, 1974, in the former Vanda Station, located near a salt lake in the McMurdo Dry Valleys, at a latitude of 77 degrees South, and 17.5 °C (63.5 °F), recorded in the Argentine Esperanza base in March 2015 (see below). The Australian Casey Station is located on the coast of the Indian Ocean, at a latitude of 66 degrees South. Oddly, the average temperature at Casey Station reaches its minimum of -15 °C (5 °F) in May, probably for the change in atmospheric circulation that occurs in winter, while it peaks around -0.5 °C (31.5 °F) in January. At the Esperanza Base, located in the southernmost and warmest part of Antarctica, at the tip of the Antarctic Peninsula, at a latitude of 63 ° south, the temperature is even higher, in fact, the daily average ranges from a low of -10.5 °C (13 °F) in June to a high of 1.5 °C (35 °F) in January. The cold record is -38.4 °C (-37.1 °F). Along with the record of low temperatures, Antarctica also holds the record of the strongest winds: winds between 100 and 200 kilometers (60 and 125 miles) per hour are not uncommon, but sometimes they even exceed 300 kph (185 mph), with maximum gusts of about 360 kph (220 mph). The blizzard is so terrible that it is an obstacle to human activities even larger than the cold itself. It usually blows from inland to the sea, it is more intense in winter than in summer, and it is due to the huge difference in temperature (and hence in air pressure) that is generated between inland and coastal areas. These strong winds cause a huge wind chill (the phenomenon whereby the wind makes it feel colder than the real temperature), so much so that the perceived temperature in the worst moments can be far lower than -100 °C (-150 °F). The winds that blow from the higher elevations of the interior, and descend in altitude, finally reaching the coasts, are called katabatic. General atmospheric circulation plays a role in the formation of these winds: at high altitudes, subtropical winds blow towards the interior, in order to prevent the continent from getting even colder; then, these air masses descend downwards (subsidence), and after having cooled down above the ice cap, they move towards the exterior of the continent. In the Dumont d'Urville station, for example, there are on average 11.6 days per month when the wind exceeds 100 kph (60 mph), with a minimum in January (of 7 days) and a maximum in August and September (of 14 days). This station has experienced at least one episode with wind gusts above 230 kph (145 mph) in all months of the year, and the overall record, which has occurred in June, is an astonishing 324 kph (201 mph). These cold winds, once they reach the sea, feed low pressure systems which give life to the so-called West Wind Drift, which sweeps the oceans around Antarctica: the result is a stream of water that travels from west to east at a speed of 20 Km (12 mi) per day. Winds shape the surface of ice and snow, in a manner that reminds of sand dunes in the desert. 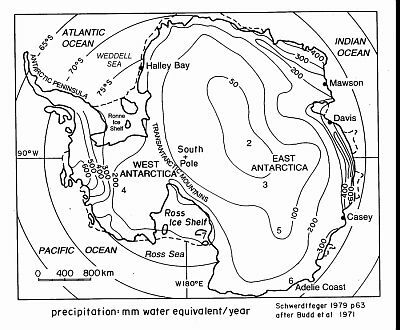 Actually, precipitation in much of Antarctica is desert-like almost everywhere: in the interior, it's lower than 50 millimeters (2 inches) per year, and it exceeds 300 mm (12 in) only near the coasts, with peaks of 600 mm (23.5 in). Strange as it may seem, drought makes fires dangerous because of the limited availability of liquid water. Looking at the last two maps, we can see that there is a correspondence between temperature and precipitation. An average temperature of -25 °C (-13 °F) roughly corresponds to an average precipitation of 400 mm (16 in), while temperatures below -55 °C (-67 °F) correspond to precipitation below 50 mm (2 in). This is explained by the fact that at -55 °C (-67 °F), the saturated vapor pressure is 30 times lower than at -25 °C (-13 °F): in other words, the air can hold much less moisture, so it's not able to produce a high amount of precipitation. And so the coldest areas are extremely arid, among the most arid in the world: precipitation in the South Pole amounts to just 2 mm (0.1 inch) per year, so it practically never snows (or at most, a very light snow falls), and at Vostok, it amounts to about 20 mm (0.9 in) per year, although the wind can carry the snow and accumulate it where it finds obstacles (for example, the buildings of a station). Here is average precipitation at the Casey Station, which, being on the coast, receives a higher amount of precipitation, largely in the form of snow. However, given the temperature, it is possible that some rain may fall in summer. The amount of sunshine is not very abundant in peripheral and coastal areas: in autumn and winter, the days are very short, while in spring and summer, the sun is often covered by clouds. Here, for example, are the hours of sunshine per day in Casey. On the contrary, in the central part of the continent, such as the South Pole and Vostok, while it is true that the sun never rises in the long polar night, in the summer months, not only the sun is always above the horizon, but also the sky is almost always clear. So, the Vostok station, as well as the coldest, is also one of the sunniest places on the planet, with 3,760 hours of sunshine per year, despite the fact that the sun does not even rise in the winter months. However, snow and ice reflect most of the solar radiation that reaches the ground, while in winter, the absence of sunlight causes a radiation deficit, which tends to cool down the soil. This produces a unique temperature inversion, which, in winter, can exceed 30 degrees Celsius (55 degrees Fahrenheit) between the ground and an altitude of 1,000 meters (3,300 feet) above, also because of the warmer subtropical currents, which flow, as mentioned, at high altitudes. In July 1989, at Vostok, a difference of 34 °C (61 °F) was recorded between the ground, where the temperature was -78 °C (-108 °F) and 600 meters (2,000 feet) above, where it was -44 °C (-47 °F); the temperature was -73 °C (-99 °F) still at 8,000 meters (2,600 feet), so it was higher than at ground level. Along with electromagnetic factors, temperature inversion causes curious optical phenomena, such as sundogs and halos around the sun or moon. Owing to both low temperatures and strong winds, the air in Antarctica is characterized by exceptional transparency, brightness and acoustics: it is possible to spot mountains at a distance of as far as 550 km (340 mi). The absence of objects such as trees and houses, however, makes it very difficult to evaluate the distances. Effects such as light refraction and reflection also cause frequent mirages, favored by the presence of tiny ice crystals that are continuously formed in the air because of low temperatures. Meteorological observations in Antarctica started very late, partly because of the adverse environmental conditions. Prior to 1957-58, the International Geophysical Year, there were stations only in the Antarctic Peninsula and the Ross Sea. But it did not take long for scientists to understand the importance of knowing the climate of the continent, in addition to the fact that it offers a privileged point of observation for the study of the past and present climate of the Earth (in fact, ice layers preserve the memory of the chemical composition of the atmosphere of past ages, from which we can deduce the air temperature), but also for the climate prediction of the future. Phenomena such as global warming and the ozone hole, which was discovered here and here has its greatest intensity, have attracted and still attract groups of scientists who continually defy the cold and the wind to carry out their studies. In Antarctica, temperature variations from year to year are considerable: the standard deviation of the mean annual temperature is generally around 0.61/1.56 °C (1/2.8 °F), while for example it's 0.5 °C (0.9 °F) in London. The difference in the average temperature from one year to another can be as high as 4 °C (7 °F). As for the trend, the South Pole does not show a clear temperature rise over time, while coastal areas show a remarkable rise of almost 0.3 °C (0.5 °F) every 10 years in the last 4 decades, with peaks of 0.5 °C (0.9 °F), i.e. more than three times the world average. On the contrary, until not many years ago, there seemed not to be any increasing trend in temperature in the Arctic. Contrary to what happens in the rest of the world, where glaciers are retreating both in the mountains and in the Arctic region (see Greenland and Arctic Ocean), the extent of the ice in Antarctica has actually increased (though less than it has declined in the rest of the world). Contrary to what one might think, even this phenomenon may be due to global warming: on the one hand, in cold regions, an increase in temperature allows for an increase in snowfall (as long as the temperature remains below freezing); on the other hand, the greater ice extent may be due to the higher speed at which the ice from the inner part of the continent slides towards the sea. However, by 2017, the Antarctic ice has also fallen to historic lows.